The language of words or the lack of them often gets in the way of us humans effectively communicating, not expressing how we truly feel, or what we This is the result of our inability to use words as they were originally intended: to create what we want or need. Let us now look at language through new and expanded definitions of words that create language. 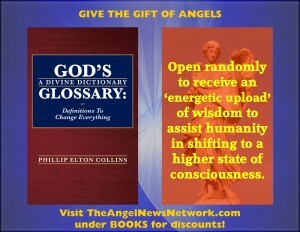 The words and their definitions within this glossary are intended to feed the heart and soul, as well as the mind, and unite us. These word of God definitions possess the qualities and powers that belong to the words themselves. This glossary is intended to return you and the word to your original divine intention; for you to know you are God experiencing yourself. The word is still our most powerful tool. It was the disconnect from the words of higher realms that caused the demise of past golden ages. The present and future effective receiving and giving of words will ensure the creation of our final golden age. Let the following words and their divinely expressed definitions delight and enlighten us toward our truth, love, and support of one another.